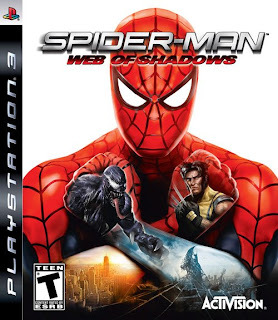 Spider-Man: Web of Shadows is an upcoming video game for the PS3, PS2, PSP, Xbox 360, Windows, Nintendo DS and Wii. The concept involves Venom returning New York to infect the city with an army of symbiotes. S.H.I.E.L.D. has quarantined Manhattan to prevent the invasion from spreading. Spidey will team up with both heroes and villains from the MU to stop the invasion before he himself is consumed by the symbiote, attached to him once again. I think the coolest thing about this game is the fact you, the player, will be able to choose the game's outcome, which villain to fight against AND the ability to switch between the original Red and Blue suit, and the Symbiote suit at any time! Web of Shadows will be released on the mentioned platforms October 21st.